In Safari, the logo for this site singh-ray.com doesn't show at all and theres a gray bar that says "Content Here" above the nav bar. In Firefox & Chrome, the same things are missing but there's also a Heading in a handwritten font that shouldn't be there at all. And... there's an about us paragraph that should be in the footer 1 spot but is in the sidebar. In widgets Footer 1 looks empty. I also don't see it in the sidebars at all to grab and move it. Any ideas? 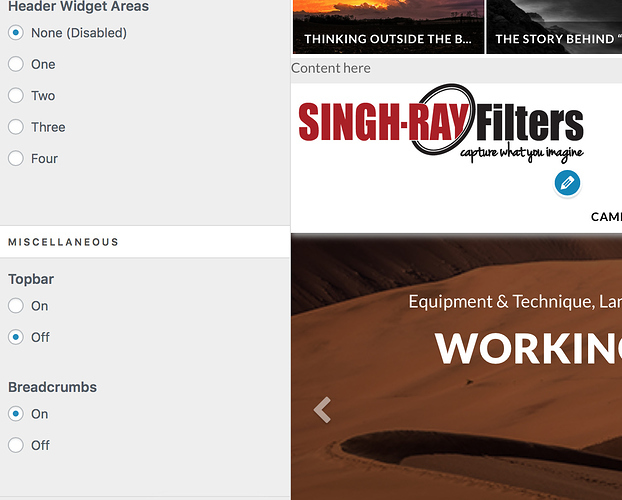 The section which says The Content Here is the Topbar. You can turn it off by going to X > Launch > Options > Header > Topbar. And whenever there is no logo image fount it will show the title of the website as a heading. Go to X > Launch > Options > Header > Logo - Image and add proper image there. Those are the options and features of the theme which is normal, I wonder if you are new to the website somehow? As these are some stuff that indeed is set and you not knowing about them makes no sense. Someone must have added those widgets and option, the theme cannot do it by itself. Are there other people working on your website and have access to the dashboard? If yes you need to contact them and ask for details. That's the strange thing here. I've used X with woo commerce SOOOO many times and had no issues until this site which has been nothing but trouble. The topbar is turned off so I don't know why the gray bar is showing. Any other ideas? The logo was there and all of this WAS working before. Can you please disable the child theme and activate the parent theme, it seems like there are customization in there that could be conflicting with the theme.